A Walk-in Bath is ideal for anyone with disabilities or mobility problems that make using a conventional bath uncomfortable. Our Walk-in Baths can provide a safe alternative to a standard bathtub. They come fitted with an easy to open door with left or right entry. Our Walk-in Baths offer security so that bathing becomes easy and relaxing giving you back your independence. Walk-in Baths can be fitted with a wide variety of taps and shower screens to suit all types of bathroom decor. We always install thermostatic temperature controls on the taps to ensure safety when filling and emptying the bath. 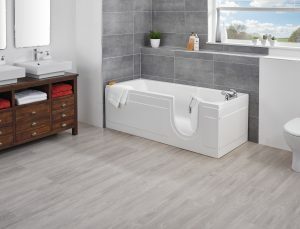 A conventional size Walk-in Bath is very similar in style and function to a regular bath with the addition of a seal-integrated door to the front making access easy. We also offer a smaller size (4 ft) for rooms that have limited space. If you would like the option of showering as well, then a shower and screen can be fitted. With a high quality Walk-in Bath you need no longer depend on the assistance of others. Experience the comfort of a deep-filled bath once again with our safe, sturdy and accessible bathtub. If you are struggling to bath then this could be the perfect solution. We can offer supply only or supply and fit for our Walk-in Baths. Contact us for more information on 0800 566 8889 or to arrange for one of our specialist surveyors to call. We install throughout Kent and most of the South East. To book your free survey and quotation please complete our contact form! Your company recently supplied and fitted a new bathroom to my property. I feel that I should write to you to express my entire satisfaction with all aspects of the work. Tom, the fitter, was friendly, helpful and polite. He worked conscientiously, and the standard of his workmanship was first class. I couldn't be more pleased with the end result. I would have no hesitation in recommending you to others. For more testimonials please click here.